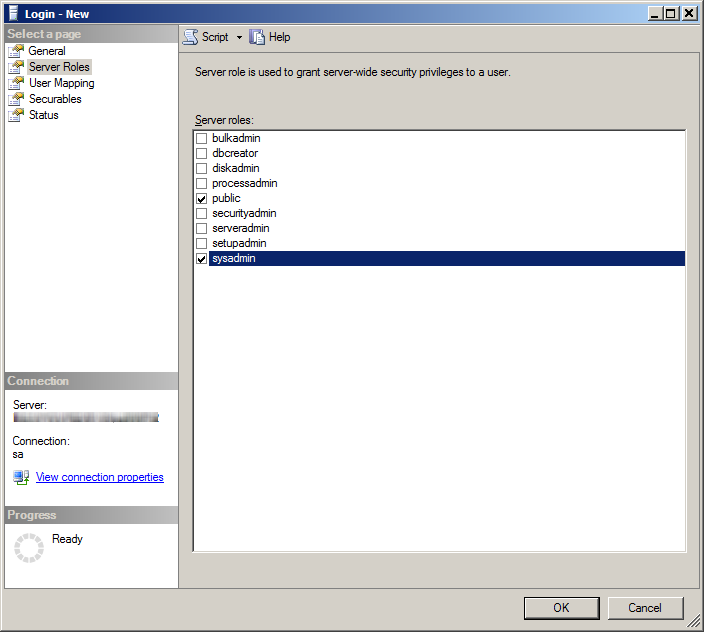 Security policies within companies may restrict the use of the sa login (used by default in Bizagi) or a login account having the sysadmin server role, for the connection to a SQL Server database. Due to this reason, we illustrate what login accounts are needed for Bizagi Studio, and how to create them with the necessary rights. These are listed in a hierarchical order, in which the top login account can accomplish what the lower one does, but not vice versa. The most important login account is that one for the process administrator (others are optional). This login account will not be used from Bizagi Studio. The objective of this account is to administrate the other login accounts (i.e, create the login account described next), without having to rely on the actual DBA. 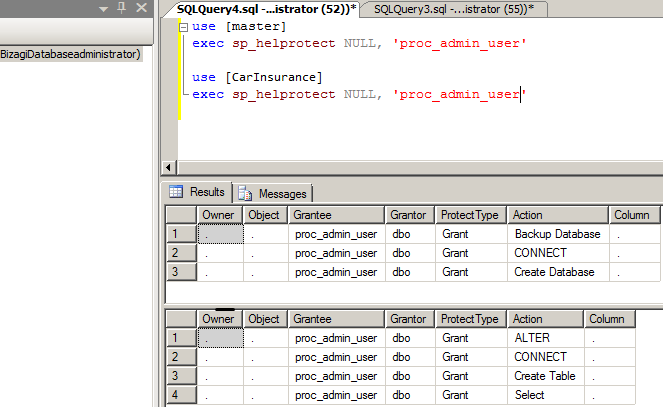 Create database, backup database, grant view any definition. Configuring the use of this login account in Bizagi Studio should be done at the Bizagi Server where the project will be hosted. By means of this login, you will be able to: create new or update existing Bizagi projects, and to perform project deployments. •DB Owner of the specific database of the Bizagi project. Configuring the use of this login account in Bizagi Studio should be done for the process analysts' workstations (when in a collaborative teamwork setup). They would all share the same login account. It will allow you to work on a Bizagi project (model the process, define the data model and user interfaces, create business rules, etc). 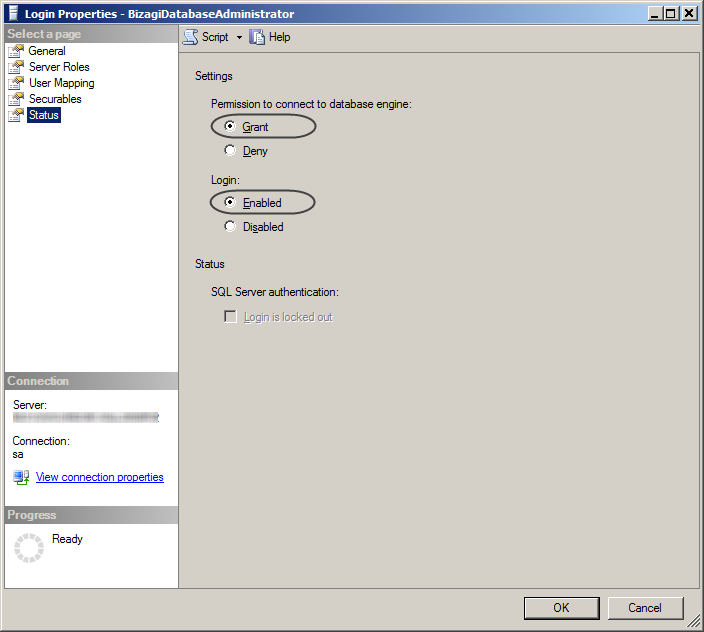 While using the SQL Server Management Studio, make sure you are connected to your instance with a super administrator account (i.e, with the sa default one). You may create additional login accounts, according to the involved profiles, as description below. 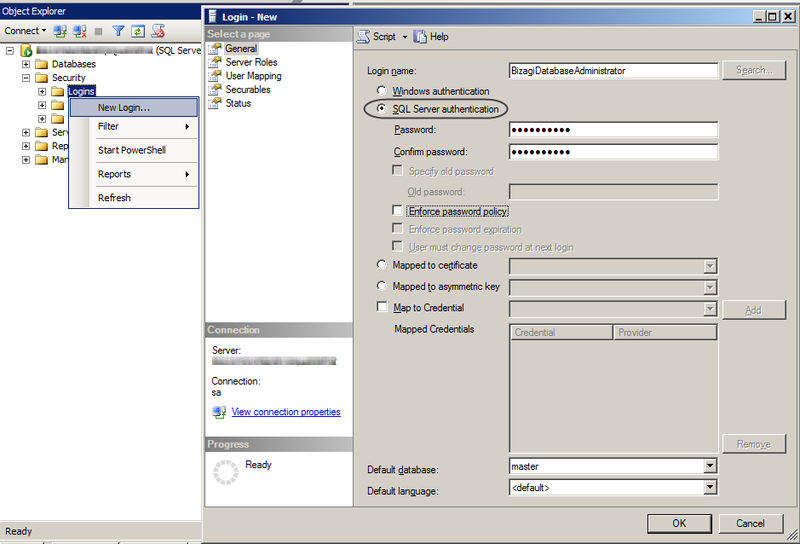 Create a new system administrator login account, in order to manage other login accounts and stop using the sa one. Use the system administrator login account created previously (or the sa login account if you skipped this step). •process_admin_user: Should be replaced with the name of your login account. •process_admin_password: Should be replaced with the password you set for your login account. Once that the script is executed successfully, proceed to execute the Validate_Bizagi_Roles.sql script in order to make sure that the roles and adequate rights are set. Such script validates and adjusts the configuration in question, and it won't perform modifications if it detects that these are unneeded. At this point, the login account has been created. Keep in mind that this login account will be used in the Bizagi Studio configured at the Bizagi Server when creating a new project. Use the system administrator login account created in the first step (or the sa login account if you skipped that step). •proc_analyst: Should be replaced with the name of your login account. 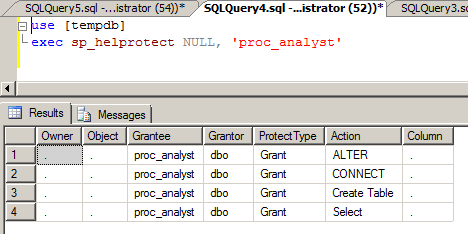 •proc_analyst_password: Should be replaced with the password you set for your login account. Keep in mind that this login account will be used the same, in all Bizagi Studio workstations for team members joining to an existing project. Whenever the database instance is restarted, keep in mind that any definition at the tempdb database is cleared up. Otherwise, this login account will not be able to create or update a project, or perform a deployment. Whenever the configuration in Bizagi Studio uses a login account which is not entirely authorized, you may redefine the login account involved for your Bizagi Studio installation. You may do this from the prompt shown while attempting to use a feature that requires authorized credentials, or from the option to reconfigure the database connection.